I remember things in a very cinematographic manner. When I was writing this, it seemed appropriate to start out in the present tense as I conjured the feeling of remembrance as it first takes over and sets the scene, so to speak. Think of it as a kindly narrator (I like to imagine Morgan Freeman) easing you into the opening scenes and then fading away as the story unfolds. The story continues in the past tense as we simply observe from afar. Look, I don’t know if it’s technically correct or not, nor do I really care. It’s just how I think about these matters. We never did the whole "Disneyland" and "Florida" thing growing up. But, we did a lot of road trips involving visits to family in New Brunswick. Dad loved to drive. In my case, it wasn't the journey, but the destination that I anticipated. Also, whoever said "You can't go home again", never knew my dad. This is how I remember dad’s homestead. We spent a lot of time there when I was a kid, for summer vacations and in between times. 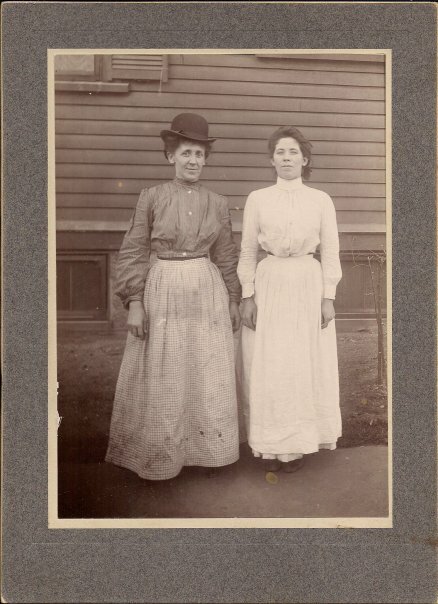 Located in rural New Brunswick it was a paradise of farm animals, cats, home cooking, curious oddities such as milk separators and actual fresh milk from a cow, as well as boat loads of cousins to play with. Never a dull moment...well, mostly. Dad's homestead in Rusagonis, New Brunswick where I spent a lot of my summers playing which included snooping and banister sliding, with or without my cousins. There’s a quality to a summer day which takes me down memory lane in a random manner like I’m following a delightful path through a quiet wood with the soft spring of pine needles beneath my feet. That part of the day when time whispers down to a low thrum, silent save for wind through trees as the leaves blow inside out in a frenzy and the only sounds from the outside world are intermittent; cars passing on distant roads - a lawn mower’s song of summer. Somewhere, a dog barks as a car moves close to the driveway - a rumble on dirt roads - then carries on into the silence. No company arriving to break the boredom. A silent, somnolent summer afternoon where nap time was avoided as a child and embraced as an adult. The sounds of an old farmhouse now - occupants engaged in quiet, earnest adult talk about church and scripture and who is ill and not much to do as a kid except to stare through lace curtains out a kitchen window and listen to a lone crow in a far field - the smell of warm fresh milk in pails drifting up amidst the buzzing of curious flies. I watch shadows from waving hollyhocks dance through the curtains in the front window, and think about the sleeping setter on the front porch. I move to the living room that seems all brown, beige and grey-toned, past the murmuring relatives and into a centre hall. The “front door”, hardly used, lets light into the space where the staircase rises, its banister a lovely invitation to a slide. Dad's family - my aunts and uncles loved to visit the homestead and many still live in the area. There was always company in Grammy's kitchen. The house was filled with laughter and boisterous conversation. In fact, it has lately occurred to me that the only time they "murmured" was likely when they were discussing some juicy family tidbit around the kids. After all, "little pitchers have big ears". The back room is a parlour from the era when one used a parlour only to display the recent dead or someone from the church. Grey, lavender wallpaper from a distant age and family photos in sepia and black and white. An old organ dominates one corner and is likely worth a small fortune should someone have the eye for it. I heard later that Grammy or Aunt Margaret paid someone a dollar just to haul it away. But then, back then, I played - moving the stops in and out and navigating the carpeted pedals with my child feet. It was a two-kid job back then. I took piano and could read music so I picked out simple notes from an ancient hymn book and played what I knew and made up the rest, happy and engrossed for the time being. Moving now, through the house like I’m the only one in it. The downstairs bathroom - Uncle Archie’s bathroom - with its unchanging decor and a window looking out to a field. The smell of Castile soap was unique to that bathroom to a point that whenever I smell it in this day and age I am back there again and washing my hands before dinner. Washing off the fragrant but scratchy feel of hay from the haymow. Uncle Archie “washed up” in the kitchen at a sink with a high shelf above it. There was a small, rectangular black framed mirror where he would peer to shave. A clock was on the shelf, its ticking marking away the hours and the days. The barn had a shed-like front part filled with the machinery of farming. Foreign to me, the kid from the city, yet I have a picture of my smiling father carrying milk pails from this very building, when the barn was newish. Perhaps it was already permeated with smells of cut grass on blades, grease and gasoline - underlined with the faint yet not unpleasant miasma of fresh cow manure. 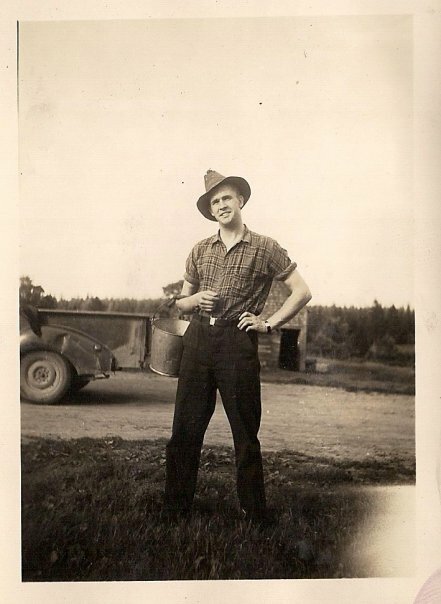 Dad (in hat) with a pal, looking entirely too happy and handsome to be doing farm chores. Grammy made the best porridge on the old wood burning stove. I got to lift the cast iron burner lid off with a hook and watch the dancing flames as the fire lit - how she knew the right time to cook on it was beyond me but it looked pretty and there was nothing quite like the heat from that wood burning stove, nor the smell or the crackle as pots boiled and garden produce changed into dinner. 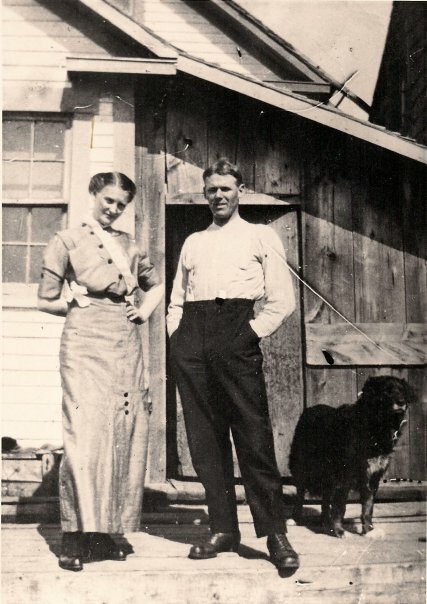 My Great Uncle Archie and Grammy on the porch of the old homestead, watched by a ubiquitous cat. Rural New Brunswick Gothic at its best. The decor was largely unchanged from when my dad was a kid and dark wooden cabinets still dominated the corner of the kitchen. Grammy had one lower drawer which when pulled out, revealed a large receptacle for flour, it’s sides constantly covered with white. It seemed that someone was always preparing the next meal or dessert and the kitchen often hummed with activity - more so when a car load of cousins arrived and I had company on a different level. From the ceiling, hung old fashioned fly catchers, their sticky, corkscrewed tapes festooned with dead flies which caught the light in their jewel-toned wings. I often wondered when they would be taken down. At which point were they deemed full enough of fly corpses? Grammy could catch flies in her hand without moving a muscle elsewhere - quick and deadly. My dad would chase flies the same way and now my husband hunts them with military precision, often using my good magazines (the ones I haven’t read yet) as weapons of mass destruction. It makes me laugh out loud. I saw things from a different height back then and the world of my aunts and uncles was far above me. I moved in stealth, certain that no one knew of my explorations and snooping. I marveled at tiny back rooms off the living room which had hooks along the wall, clothes and canes and hat boxes that seemed to have been hung up one day in the distant past, and never moved again. Frozen in time. A lot of black. Upstairs was another bathroom at the top of the landing, it’s light pulled on by a dangling string. Doors to bedrooms were wooden with high latches and each room seemed to lead into the other until you reached the large expanse of the “front bedroom” which was over the kitchen downstairs and contained another wonder to a kid - the back stairs. A great place to chase cousins through hallways and rooms, shrieking and giddy and locking doors after us until shushed by someone older. A great place to sit hidden in the dim of the old back stairs and overhear grownups talking over cups of coffee. Just a few of my cousins, with yours truly on Grampy's lap. At any given time, there were hordes of us running around in and around the house. The only time we stopped was to eat. I'm not sure hands got washed first though. Hallways and landings in the old house were light filled, silent spaces and there I would find antique glass fronted bookshelves with musty novels and leather-bound copies from generations past. A few years later we would receive a box of these books and find copies from the 1600s, some with pen and ink names in copperplate script, lovingly written onto the front leafs. Names of relatives long gone but not forgotten. In one upstairs nook hung a sabre from the wall - a relic from the Boer War, I heard. I never knew to whom it belonged. A window at the end of the upstairs landing overlooked the front yard and a tall, spreading elm tree. Cracked open a bit, it let in the smell of newly mown hay. Victorian lace curtains moved gently. Potted African Violets and Jerusalem Cherry plants crowded onto an antique table, competing for sunlight. Dad's sister Margaret and her husband Milton lived in the house too and their bedroom was off the upstairs landing. We would often stay in that bedroom when we visited. A framed lithograph of a ring of angels hung above the crib where I slept. I found the same print one day in my thirties as I rummaged through the attic in the building where I used to live and found a box of old art books. I kept it for years. Summer goes too quickly now. Broken up by months with beginning and end, appointments and responsibilities marking each day with useful activities and deadlines and before you know it the season changes. Before you know it, another year older. Photos capture partly, words more, but beyond the frames of pictures and paper the memory runs free and colours in those days that moved so slowly, with glimpses of detail that come and go, spurred on by the recollections of others. Taken out and looked at, polished often, held up to the light and edges smoothed to a pleasing softness, our memories are the treasured bric-a-brac of a comfortable middle age. I often wonder why we remember the things that we do and even if they are important to anyone other than ourselves. One thing I am sure of though, is that Dad's house was meant for children. Not just in a farm hand practicality, but in that its very essence seemed to come from the distilled laughter and natural energy of generations of kids - all just living their lives according to the guidelines of the times, within the loving framework of family. One thing I'm amazed at, is that there were no accidents involving kids and pitchforks. The old homestead was sold to new owners long after I left home, but I hear that there is a standing invitation from the current occupants to any members of our family who are interested in dropping by for a visit. I wonder if that invitation includes a free slide down the banister? *Author's note: While searching for the aforementioned photograph of me with the cat, I tore the house apart. Although I didn't find it, I did come across my birth announcement card and photo from 1961, a couple of 200 year old leather bound bibles, various other photos from my mythical youth, my marriage certificate, my pristine airline ticket from Halifax to Montreal from 1964, and my dad's original UNB thesis on the history of Telephony from 1950. Photo credits: Phillips Family Network (via Facebook and Rhonda Nicholson, including various other cousins' contributions on the site - Thank You all!) as well as Author's personal collection.